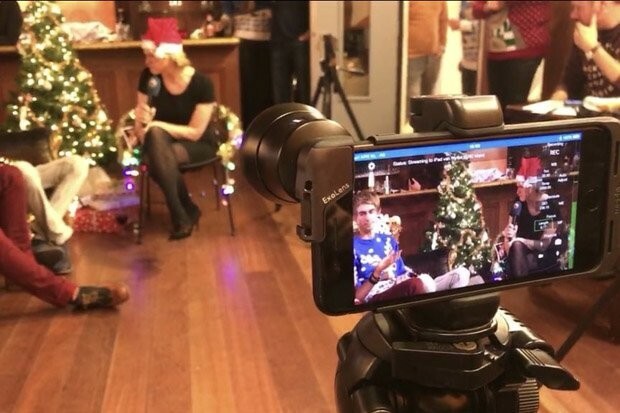 Dutch regional broadcaster Omrop Fryslân has produced its first Facebook Live with multiple cameras, a light-hearted piece for social audiences called De Grutte Bjusterbaarlike It Is Hast Krystshow (The Amazing 'It Is Almost Christmas' Show). The experimental live stream lasted an hour, and saw eight guests join presenters to take a look back at the organisation's sports, news and entertainment coverage over the past year, where audiences had a chance to win Christmas jumpers in Wheel of Fortune. Wytse Vellinga, mobile journalist at Omrop Fryslân, managed the technical production of the show, using three iPhones, an iPad and two hand-held microphones from Go Mic Mobile. He worked alone, but was able to manage the shots and switch between cameras using Teradek Live Air. The team opted for a friendly, laid-back approach to presenting – a far cry from the highly-produced, rehearsed and polished one they have for TV shows. "We just used the lights as they were in the building, and there was no need for things like make-up – I showed up half an hour before we started and it was just a case of setting up the iPhones and the connection. "The build up was more about setting up the Christmas tree than dealing with the technical set up," he joked. "No one had to go through all the pre-production set up they were used to. Presenters arrived and went live – it's a more relaxed way of doing it. "We didn't want to advertise it too much, because we hadn't done this before and we might have needed room to fail – we teased it on the page but didn't give too much away." The format of the show, as created by Lars Hoekstra and Ronald van der Pol, had guest journalists interviewed by reporters on the sofa, who linked to eleven 30-second pre-recorded packages over the hour-long show. Vellinga said he noticed viewer numbers rose when the presenters played the 'Wheel of Fortune', and dropped off when more serious subjects were discussed. "You could see that the viewers want something visually exciting – we went for goofy, and it went well," he said. Working on the switchboard, cameras and audio at the same time, all while directing and counting down until the presenters were live, was quite a big job, Vellinga explained. "You'd usually get six or so people working on a regular show, but during our Facebook Live it was all up to me. I found that to be manageable but rather stressful – there are a lot of things that need to be taken into account so next time I'll need an assistant," he said. "It all went very smoothly because it was well planned. We did a rehearsal on the Friday before the show on Sunday, and I had a clear overview of the layout of the show and what went where." As the news organisation produces live television, the presenters or guests, who were all reporters at Omrop Fryslân, weren't nervous to go live, unlike journalists who mostly work away from the camera may be. "Going on Facebook for them didn't feel like such a big deal, because on TV, they practice everything and have almost everything written out that they are going to say, but now they could just sit there talking, which was nice and easy for them," he said. He noted that even the reporters who were used to radio felt that the Facebook Live was non-threatening, because there were no large cameras or heavy equipment to make them nervous. Vellinga did experience some technical problems that he is looking to find a solution to before they go live again. "Connecting three iPhones through the iPad meant that it took a lot of the 4G bandwidth, which meant there was a bit of a delay between cameras sometimes, and sometimes a delay between audio and video," he said. "The solution might be to go through a stronger WIFI connection but I'm not sure how to solve that yet." Any comments or questions sent in by the audience were monitored by another staff member, and passed to the presenters who could ask them to the interviewees. But Vellinga said that most of the comments were actually focused on getting a free jumper, rather than asking about the news stories. "We are most definitely going to be doing this again, we have lots of ideas. Maybe doing a politics programme during the elections, and a sports programme to cover the professional football league, and not just going live on Facebook but using the technology to go live on TV," he said. "I have tried with Android, but the apps just don't offer the professional features that Live:Air does, like switching between more than four cameras, playing pre-recorded packages and adding text. "I would like to try having a reporter in the field totally on their own running a news show on TV, where the reporter plays out the VT clips themselves – producing and presenting the work."